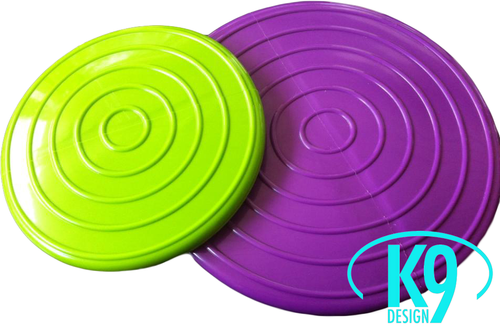 K9Design manufactures eggballs, halfballs and discs for dog balance and rehabilitation training. If you would like to resell our balance products in your own business, you can contact us for more information: info@k9design.se or give us a call at +46 70 453 23 71. How is your dogs physical shape? How do you get your dog in shape before competition season? Do you just want to have alot of fun with your dog? With balance ball exercise you reach muscles that are hard to reach with other type of training, that means the small muscles surrounding the joints. We are hoping that more people will see how efficient and fun this kind of exercise is, both from a wellness point of view but also for rehabilitation. The cooperation between the dog and it's owner is also often strenghtened with this kind of training, as well as cautious dogs often get more confidence with the balltraining. When you exercise with the ball the safety comes first! Before you start the training you need to see that the ball is stabilized and that there is no risk for it to roll away and the dog gets injured. The eggballs shall be inflated to their maximum size when you start working with them. The first time you fill up the eggball with air, you fill it upp to 90% of its maximum size and let it rest with the air inside for 24 hours, then it will have time to expand. Then you fill it up to it's maximum size and it is ready to use. Tip! Keep your dog's claws short, that will reduce the risk of the dog getting damaged claws and also it will reduce the strain on the balance tool. Do not lean the ball towards radiators or sharp edges. Note! The products are exercise equipment that you only use together with your dog, they are not toys. The unique shape of the eggball allows it to have a larger contact with the floor which contributes to increased stability during use. The eggballs are manufactured in an exclusive material that makes the ball deflate slowly if a small hole or a small tear occurs, the material also provides a better grip for the dogs paws. The eggball is a great complement to wellness training. You choose ball after your dogs length, the dog shall be able to have the joints underneith it self when it is exercising on the ball. When you start your exercise on the eggball it should be filled to it's max. circumference, when the dog is comfortable and conditioned you can release some air out of the ball, then the exercise gets more difficult. 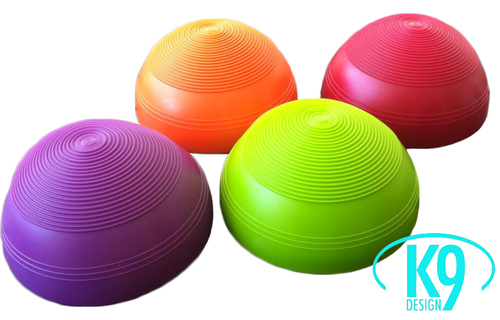 The halfballs are a great tool to use for bodyawareness, balance and exercise the paws. K9Designs halfballs do not have any spikes on them and you can adjust the air inside. The disc is a great product to start your balance training with. You can adjust the air and it provides a bigger challange when you fill it up with air. 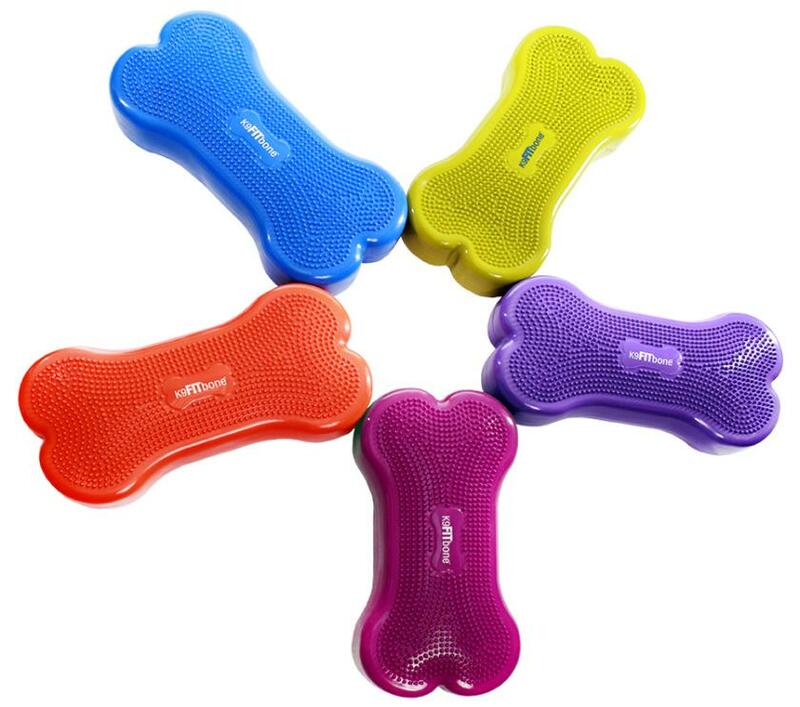 K9Fitbone is a low platform, 10cm and it provides a versatile exercise for both small and large dogs. They are excellent to combine with other balls or discs and they are a more difficult challenge filled up with more air.